I wanted to provide some photos of the wondrous Foam Roller. I firmly believe everyone–especially Runners–should own one of these! I use it every single night. It takes less than 10 minutes to do all positions and I always feel better afterward. What is a Foam Roller? It’s a dense foam that when used acts like a deep tissue massage. Using it on a regular basis can prevent common injuries from training and working out. If there’s a certain spot that is particularly sore or tight, roll over it slowly for about 10 seconds at a time and it will loosen up the tissue. 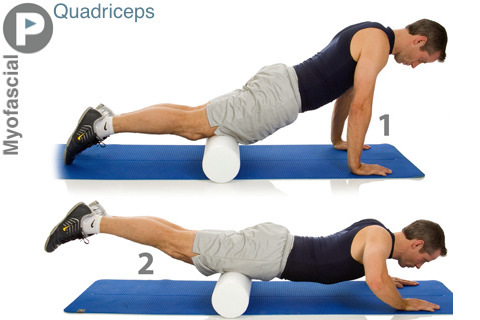 How the Foam Roller works is that you use your body weight to apply pressure on the sore spots. There are different densities you can purchase. The one I used at the gym was too soft for me. The one I use at home is very firm and dense. It’s recommended that if you are a muscular person, use a denser foam. Working the Shins: great for fixing “Shin Splints”. Working the Quads: great for runners AND cyclists. Michael does this one every night and he commutes by bike to work. 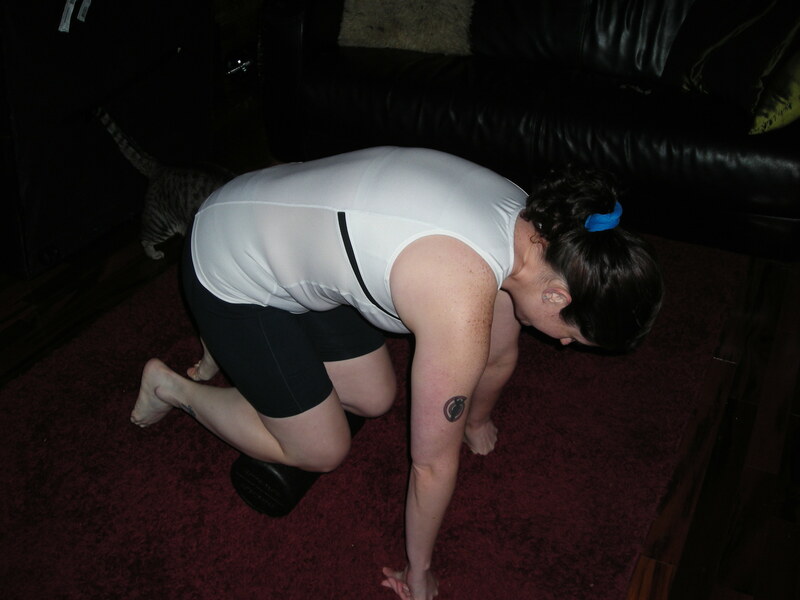 Roll back and forth as slowly as you can and really feel the Foam Roller working your muscles. Next, work your calves. It takes some ab work and strength in your arms but do what you can and take a break if you need to. Tight calves are another danger of cycling. Somehow I managed to make a ridiculous face in every one of these photos. Lame! The most BRUTAL of positions is working the IT Band. Ugh. Finally, I have a new stretch that I’ve been doing recently and it really helps my legs. To read more about the Foam Roller, check out the Running Times Magazine article Here. I bought my Foam Roller off Amazon.com for about $15. It was the best $15 I ever spent. QUESTION: Do you use a Foam Roller? How has it helped you? Also, do you have any recommendations on yoga poses for runners? I have GOT to get me one of these! Thanks for showing it in action! Get one!!! I’ve seen them online everywhere and I also saw them at 24 Hour Fitness for sale. Don’t make the mistake of buying the cheapest foam roller you can find. As Lisa mentioned, they come in different densities, and firmer ones are generally better for muscular people. For even deeper stimulation, consider the RumbleRoller (www.rumbleroller.com). Most people who’ve tried it think it’s well worth the additional cost. Great point. I lucked out with getting a good roller–that was also cheap. I had no idea what to expect and I went solely off of cost. Mine is very dense and I am so glad I didn’t get a soft one! LOL Thanks! I was laughing at Fat Kitty “helping” me and making sure he was in every photo. I ordered one! What do you think about using this on the legs to help reduce edema (swelling)? I find after work at a desk all day, I have extra water retention in my legs. bet this would help too. Worth a shot! I am a nurse and would really like to know if the foam roller reduces Emily’s swelling. I am a foam roller addict and I have pages on my website dedicated to foam rolling, if anyone is interested. It is supposed to get rid of cellulite, but I have never noticed a difference in that category! I do want to see the effects on the edema. I would publish a true story, if you are interested, Emily! I just got a foam roller and my IT band is killing me… that is absolutely the most painful exercise with the foam roller, for me at least. I’m pretty much in tears by the end of it. 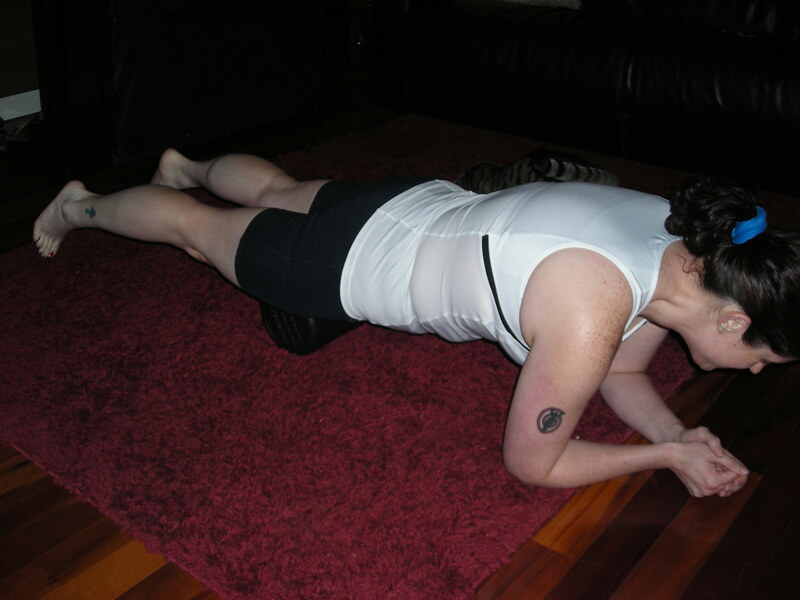 It’s definitely not an enjoyable experience….but the foam roller has helped a lot for me. Best $15 you ever spent? I kind of feel the same way about mine. These things do basically everything.